Fixed: I realized today how I screwed up the report thee weeks ago (the 4th through the 11th) by including an extra day. The last two reports after that were then off by a day instead of keeping the report from Sunday to Saturday as intended. I don't think it will change the trends much, but it's something I noticed and wanted to make clear here. 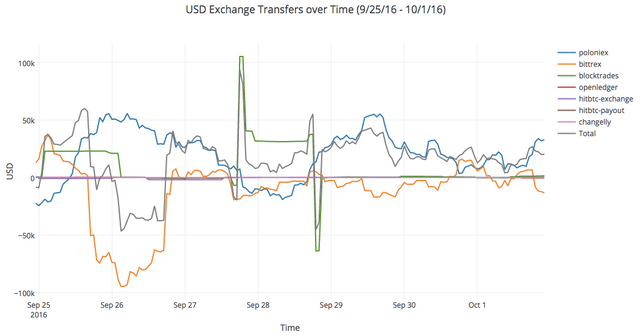 Looks like we have more transfers going to @hendrikdegrote and now also @alpha ($70k SBD!). I linked to a couple posts about these new whale accounts in last week's commentary. Do you have any new info about them you want to share in the comments? 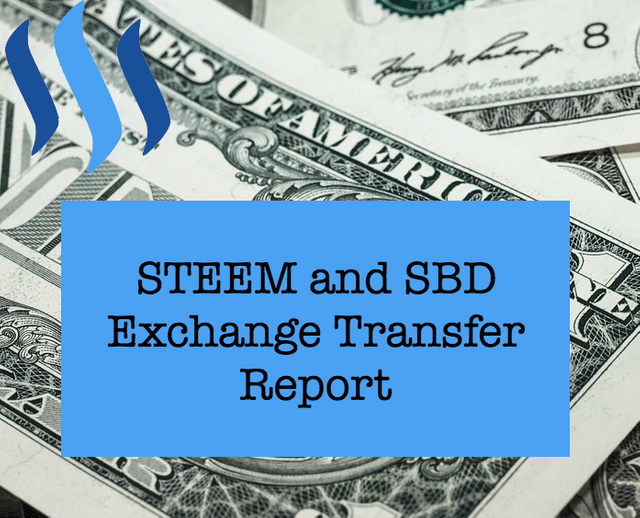 If you exclude the @steemit2 account, for the first time since I've been tracking these reports, we're actually seeing a positive number of $34,862 being sent from exchange accounts to non-exchange accounts. That's big news! Unfortunately, it may not mean much since by excluding @steemit2 but not excluding @hendrikdegrote or @alpha (which seem to be related to Steemit, Inc), we make the numbers look better than they may actually be. Edit once again, @smooth comes in with a great comment: seems to indicate @alpha isn't a Steemit, Inc related account. Last week's STEEM total: -85,025, this week is -337,567 (or -101,063 if you exclude @steemit2). 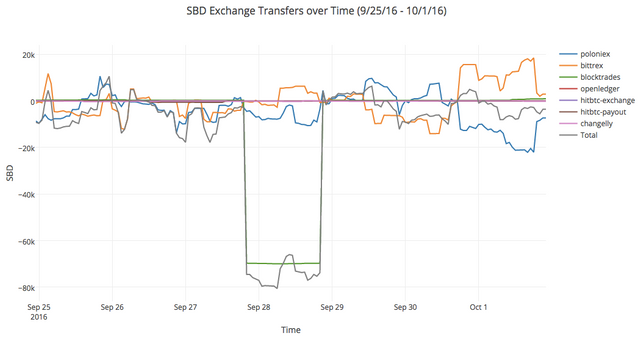 Pretty massive week of positive SBD transfer from exchanges at over $90k ($70k of which went to @alpha). I asked last week if these reports are useful to you or just noise. Thanks for letting me know you appreciate them! They take a bit of work, so I do enjoy the feedback/follows/comments/votes. I made the list again! My strategy is to keep buying SBD so I can keep gradually powering up and I also use it to promote my posts and other peoples posts that I think need more attention. Hopefully others are doing the same. Thanks for powering up, @thecryptofiend! At times I want to invest more into this platform as well, but I've already put in quite a good amount for a beta experiment (and at prices higher than this). I make enough (so far) on my posts to keep my desire for more Steem Power filled, but I also noticed myself dropping down in the Steem Power ranking as others power up. To me, that's the gamification I enjoy here the most. Right now I'm #325, but I used to be as high as #315. I would like to see active new users going up. If that doesn't happen, I wonder if this will end up being just another forgotten attempt at a social platform. I don't think that will happen because of the content being indexed and as more and more people come here via Google search, I think more will sign up to gain some of their own rewards. Thanks for an awesome response. The responses on here are one of my favourite things! At times I want to invest more into this platform as well, but I've already put in quite a good amount for a beta experiment (and at prices higher than this). I sympathise I think a lot of people are probably in a similar position. Right now I'm #325, but I used to be as high as #315. I'm sure you will make it up and get up higher again. You are a very vital and important part of the community. I would like to see active new users going up. If that doesn't happen, I wonder if this will end up being just another forgotten attempt at a social platform. That is the primary worry for us all I think when it comes to Steemit. That's why I try to help new people as much as I can. I don't think that will happen because of the content being indexed and as more and more people come here via Google search, I think more will sign up to gain some of their own rewards. I think Dan and Ned et al are continuing to listen to the community and try to improve things. I remain optimistic for that reason. Great to see the ratio change directions. Hopefully it's a new trend. The 'alpha' account uses 'blocktrades' as a voting proxy. Based on that and its status as an early mining account it appears plausible (though it certainly can't be established for a fact based on these observations) that it is owned by blocktrades. That probably means @alpha isn't a steemit employee account. I can confirm that alpha is my account. It's also my original handle on the bitshares blockchain. The steemit, steemit1 and steemit2 accounts all seem to be used for managing aspects of Steemit Inc's ongoing distribution of the original ninjamine funds that were originally powered up into 'steemit', including internal and external market trades and transferring stake to employees, contractors, and advisors. It isn't clear whether there is a specific purpose for each of these individual accounts. The one related account that does seem to have a specific purpose is the 'steem' account, which creates and funds the new accounts for users who sign up on the web site. Was it for sure a ninjamine? I hear that term thrown around a bit, but I've also read through posts like this one saying this may have been the only legal way to do it or posts like this and others which seem to indicate early mining was open for everyone, even though it was difficult/undocumented at first without a windows client and had to restart once due to a bug. Does that count as a ninjamine? "Ninjamine" is the term that has been suggested to me to describe it by a founding member of the Steemit team. I think the term "sneaky-mine" was also mentioned, but I'm not 100% sure about that, so I'll stick with ninjamine (clearly the implication of "ninja" is sneaky or stealthy though). In any case, I'm not attaching any particular interpretation to that term. Factually, it was set up in a manner so that Steemit would mine about 80% of the supply and distribute it according to a process that was described by them: 1) half distributed to new users, 2) half of the rest sold to fund Steemit Inc, and 3) the other half of the rest kept by Steemit Inc. (since one might reasonably assume they weren't necessarily stating an intent to keep it forever, this last portion might better be described as "unspecified"). This plan was officially described by the developers on the original launch thread and maybe one or two other places. Thanks for clarifying, @smooth. I've often thought of it as a derogatory term. I wasn't aware a founding member used that term also. Quite interesting. 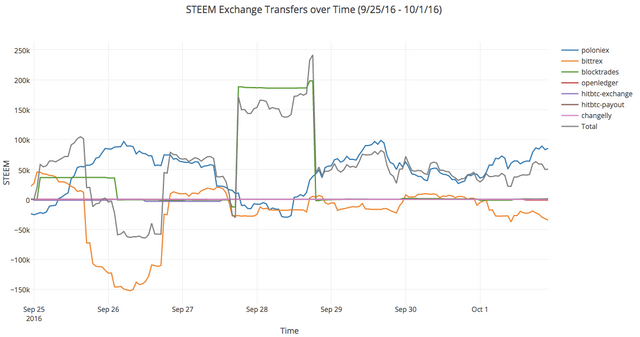 I was aware of the plan, which is why I'm often surprised when others are shocked at how much steem is being "dumped" on the market. They said what they would do and they are doing it. Should they do it slowly or differently? Maybe, but they also have more important things to focus on such as growing this platform. Thanks for the great info. It is very interesting to see who is cashing in and who is getting in. And I'm happy to see what comments there live, interesting and have value, not just "good work, nice and etc." Your numbers are confirmed in the Steem chart. The September 21 low is still holding.